This apartment has been meticulously renovated to the highest standard to give our guests the best possible experience in Medellin. Every aspect of the apartment has been completely renovated with brand new quality fittings and custom designed furniture. The apartment is a comfortable one bedroom with a large en-suite bathroom, a fully fitted eat-in kitchen and comfortable living area featuring a huge TV. The real draw for this apartment however is the large open patio at the back of the property leading to some lush green gardens and a beautifully relaxing space that is incredibly unique in Medellin. With so many high-rise apartments it’s extremely rare to find a pocket of green serenity in this bustling city, but this apartment gives you all that and more. 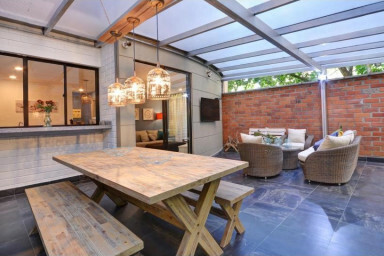 The space includes some comfortable outdoor lounge furniture with a TV and a dining table as well as a gas BBQ for ‘al fresco’ dining and entertaining. The quality of the fixtures, finishing and furniture is of the highest standard and this apartment is up there with the best with have on offer for comfort and luxury in the nightlife zone. With its premium location in the middle of the action, only a few blocks from Parque Lleras, and surrounded by trendy Provenza neighborhood, the best of Medellin is at your doorstep with some of the best bars, cafes and restaurants within a couple of blocks.